Miami, Fla. (September 23, 2014) – Singer, songwriter and producer Miguel, will be honored with the LA MUSA 2014 ‘PREMIO TRIUNFADOR’ (LA MUSA 2014 ‘CHAMPION AWARD’) on October 18th, in the city of Miami Beach. You may know him as the soulful singer on Mariah Carey’s “Beautiful” which he co-wrote and from his 2013 Grammy performance that commanded the audiences attention. With his unique and ardent voice, Miguel, who is of Mexican descent, is one of the most fervent R & B singers today. Miguel received multiple Grammy nominations with his sophomore album “Kaleidoscope Dream” the lead single “Adorn,” catapulted to the top of the charts, earning Miguel his third #1 hit single and a 2013 Grammy Win for “Best R & B Song”. 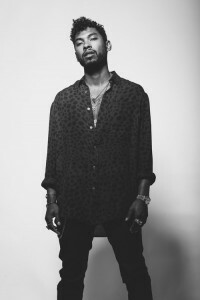 In addition to the success of his songs “Sure Thing,” and “Adorn,” all having topped the Billboard charts and his Grammy win; Miguel has toured with Alicia Keys during the Set the World on Fire tour, and co-written songs with Usher, Beyoncé and most recently Jessie Ware among others. His powerful performances and songwriting talents will continue to surprise his fans. The October gala will honor these musical legends and their unforgettable songs written in Spanish and Portuguese as well as feature moving tributes and musical performances by some of the industry’s most important talents. Additional special honorees and presenters will be announced in the upcoming weeks. Latin Songwriters Hall of Fame is a non-profit educational organization founded by renowned songwriter/producers Desmond Child and Rudy Pérez in 2012 to honor and celebrate the songs and lives of the world’s greatest Latin music creators. Songwriters, performers, musicians, producers, engineers, music critics, and industry executives comprise LSHOF’s nominating committee.